This is the second episode of the series so far to be written by J. Michael Stracsynski, and I like this even more than I did ‘Slimer, Come Home’. This is a massively entertaining, very imaginative and colourful episode that I re-watched an awful lot as a child – since the focus on this episode is on dreams, the creative team really get to have some fun. First of all, we get some bloke who would rather read the comic books of his youth than go out into the sunshine and play tennis with his girlfriend. Hey, we’ve all been there, right? Actually, he comes off as a bit of a chump. His fun doesn’t last long though, as he’s sprinkled with some strange dust that sends him off to bye-bye land….as for his girlfriend? Well, whatever that thing is that approaches her, it doesn’t look friendly. In fact, from its shadow, it looks just like one of the monsters her boyfriend was reading about in his comic…. Whiplash cut to Ghostbusters HQ (seriously, watch the transition edit – it’s sped up like Speedy Gonzalez) and Peter has had a rough night. First of all we think he’s been out on the lash and has a stinking hangover, which is quite uncharted territory for a children’s show, until we find out he’s just had trouble sleeping thanks to horrible dreams. The rest of the crew try to translate his drowsy mumblings, one of which appears to be ‘eat flaming terror’ but luckily they get a call before things get really ugly. Oh, and a helpful hint – Ray tells Peter to overcome his nightmares by saying ‘it’s only a dream’. He go the advice from his Aunt Lois, who we’ll be seeing more of later on in the series. I’m not sure if Ray’s suggesting that Peter does this within his dream in order to conquer it or after he’s woken up so as to make himself feel better. Anyway, as they drive off to their case, a mysterious hooded figure watches them leave. We will discover that he is The Sandman. He’s not very nice. It’s quiet outside (too quiet) and as the guys approach the apartment block where we started, some rather odd manifestations whizz by – you know, a bloke riding a mice-drawn carriage, a couple of camels strutting nearby, the usual. 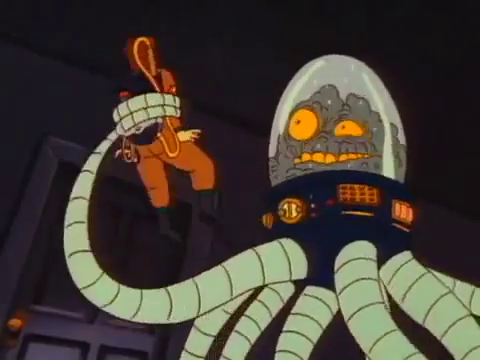 When the guys enter the scene of the crime, Peter is seized by a monstrous brain in a jar with a robot-octopus body – yep, just like we feared (hoped), it’s the same thing from the comic, and it wants Peter’s brains. I think. This is never mentioned or confirmed or even hinted at, but I like it, so I’m sticking with it. Nevertheless, it grabs him and pulls him through a doorway, which (when I was younger) got me intensely worried that he was going to become possessed again like in ‘Mrs. Rogers’ Neighborhood’ (a very similar act of grabbage occurs in that episode, with horrific consequences), but no, Mr. Brain just likes playing with his food and dangling Peter like a spaghetti on a fork. Amusingly, the guys are really taking time discussing how to combat this foe, all the while Peter’s head flies in and out of shot screaming in terror. In the end, they just blast the brain and it blows up. This is when they notice the boyfriend and girlfriend floating, asleep, above them…. Now, since both boy and girl are asleep, who called the Ghostbusters? A neighbour? Surely you’d have just called the police if you heard a scream. 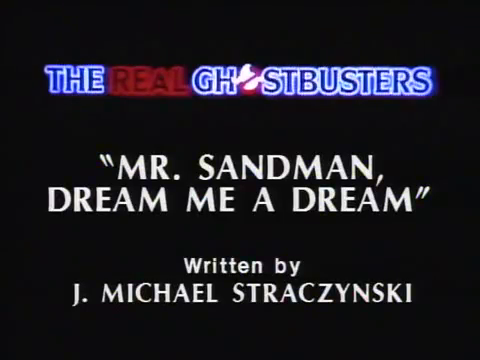 The Sandman? Have you heard his voice? Oh wait, no you haven’t, not yet. Anyway, his voice is like the Boogieman’s from the previous episode, albeit a chain-smoking version. There’s no way Janine would have taken that call without alarm bells ringing. I mean, aside from the alarm bell she uses anyway. Ok, new paragraph. So, this is the third episode in a row where the guys are up against something that isn’t a ghost. I like it. 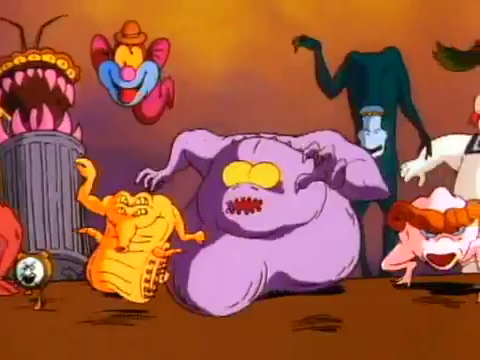 Okay, trade descriptions might take issue with a show called The Real Ghostbusters where the antagonists are trolls, boogiemen and sandmen but NOT ghosts, but I don’t. By broadening their approach, the writers get to have a lot of fun with different legends, folklore, fairy tales and the like, and we do too! 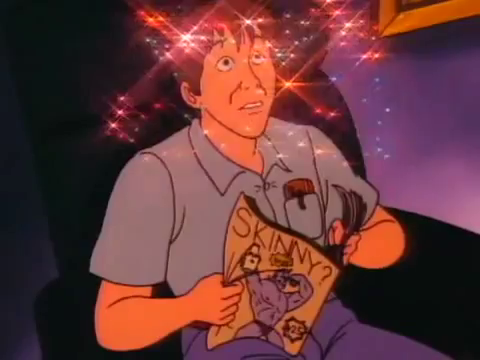 Winston notices the creature they just blasted on the front cover of the comic, and I must say that Winston is really on the ball in this episode. He’s the equivalent of the Final Girl in your everyday slasher movie in that it’s him who notices everything and stays alert and yes, stays awake. Actually there’s an extra twist in the episode where the real Final Girl stands up, but we’ll deal with that later. 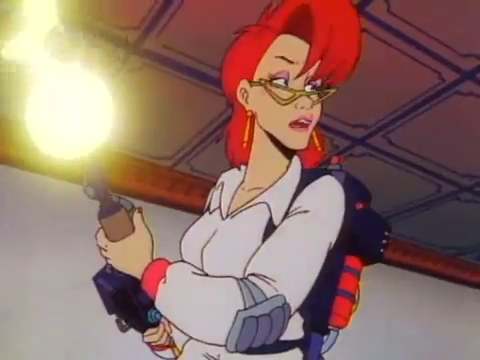 Egon’s convinced that a Sandman is responsible, and in case we weren’t sure, Tahiti arrive in the studio to perform their #1 Hit in an Alternate Universe ‘Mr. Sandman’, accompanying a barrage of bonkers imagery, such as a postbox arguing with a disgruntled (and Marxist) letter about where the latter wants to go and where he is addressed to go. There’s aliens in spaceships, a galleon, tortoise/hare races, and of course, the Stay Puft Marshmallow Man in his first appearance of the series. 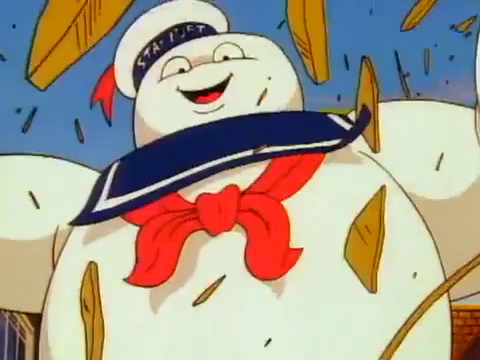 Stay Puft was of course the Destructor in the original film, a malleable entity made solid by Ray’s out-of-the-blue thought process, and even though he was destroyed, he’s back here, but since he appears in dream-form, we can’t cry out charges of poor continuity. That can come later, when he does genuinely re-appear in the Ghostbusters’ ‘real’ world in a few other, later episodes – apparently, he was captured and stored in the Ecto-Containment Unit. As anyone who’s seen the film can vouch, he wasn’t. He blew up. The Sandman himself then appears to explain his actions – essentially, he wants the world to be a peaceful place, and what better way to ensure peace than to send everybody off to sleep? He’s fully aware that his actions may be regarded as ‘renegade’, but he just does not give a monkeys. 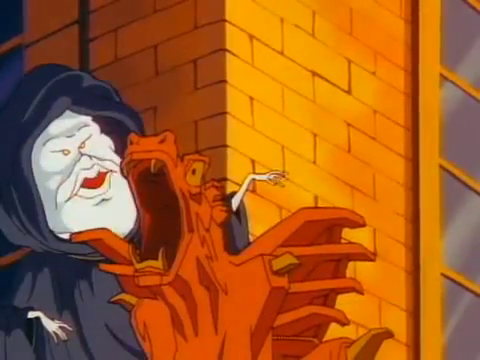 He looks a bit like an elderly version of Slimer in a cloak, albeit with white skin, not green. So, the Sandman’s intentions are kind of benevolent, even if his means of doing so are utterly insane. Contradicting his moments-ago statement that he doesn’t care what others think of him, he gets very offended by the guys mute response to his declarations of peace, and goes about chucking a statue of a gargoyle at them. Then he disappears, so the guys follow the trail of sleepyheads to catch him – then we cut to a DJ who’s getting wound up at the lack of callers and who also refers to Tahiti as ‘Silver Phoenix’, which is either a better or a worse name, I haven’t decided yet. The Sandman appears from out of his headphones (!) and the slick-talking DJ, so impressed with the visual effects on show, asks his guest if he works for Steven Spielberg. Never heard of him, the Sandman says, and proceeds to send the DJ to sleep, but not before a hilarious reference to ‘beddy-byes’, which sounds quite inspired through those distinctive vocals. He then tells everyone (over the radio) to take ‘nappies’. I’m beginning to really love this guy. Just when we thought that the chase for the Sandman was going to take forever, Egon conveniently points out that he is ‘over there’. This isn’t as funny as the ‘switch’ moment in ‘Killer-Watt’, but it comes close. The guys try to nail him, and the Sandman tries to fight back with sleep dust and accusations of ‘very naughty’ – soon enough he goes for the big guns and turns all the relatively harmless dream characters into nightmare monsters, including a scary T-Rex, a demonic knight, a purple blob, a pink tank and so forth. Cue ad break. We fade back into the guys hiding for cover in a side street (the monsters simply rampage past, clearly so excited about being evil that they don’t notice them). 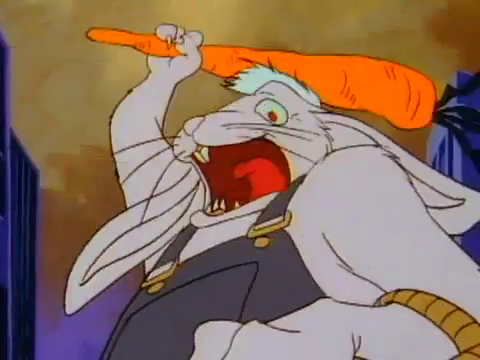 Ecto-1 is the key to escape, but it’s being guarded by an evil Easter bunny who tries to kill them with a carrot but not before a clearly traumatised Ray blasts him to kingdom come. Poor guy. It’s all for nothing as the Sandman is hiding in the bonnet, blasting Ray with sleep dust and sending him to beddy-byes. Ray dreams of huge pizzas, one of which flattens Ecto-1. A new plan is to try and avoid causing a scene and using the blasters as they make too much noise. Egon’s plot to ‘tippy-toe’ doesn’t work next to a huge dragon as he’s only pretending to be asleep. Just like Smaug in The Hobbit. Sneaky git. Winston barely gets away with a dreadful ‘stop dragon your feet’ pun but Peter doesn’t escape the Sandman, becoming his next victim. Unsurprisingly, he dreams of winning every award under the sun. At least his fantasy is less harmful than Ray’s deep pan depth-charge, so Winston and Egon leave him be. New York has become a slumberland – the music that accompanies this and the previous scene is a score that’s rarely used in the show, making it stand out all the more. Egon remembers Ray’s advice about telling yourself it’s only a dream and how this could help them out, but just as he figures it all out, he’s the next victim. 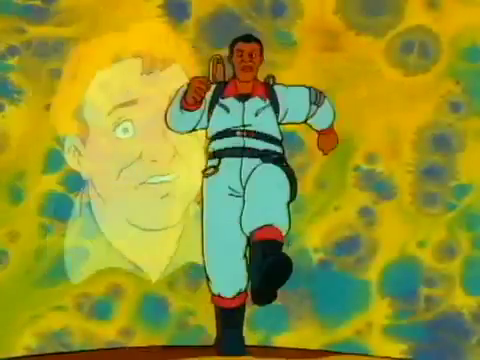 Oh, just before that, Egon and Winston try to blast the Sandman as he walks triumphantly along the street. The sound of the blasters interrupts the Sandman’s rant, and there’s something deeply hilarious in the rapid-fire way he just says ‘woah’ and disappears in a flash. Egon dreams of Einstein, who gives Winston the confidence boost he needs. Winston’s the only one who’s not a scientist remember (although Peter’s a scientist in name only, really) so he gets his brainwave by going for a flashback jog, complete with surreal voice-overs and psychedelic backdrops. Einstein also mutters something along the lines of ‘Egon equals Mc -Q?’ before this jogging sequence. We also get a cheesy guitar squeal theme, usually used for the show’s more sentimental moments – it sounds kind of like the Top Gun anthem. The rubbish one, not the cool one at the start of the movie. Sandman: Why do you resist? Wouldn’t the world be a better place if it was filled with dreams and not people? Winston: But the whole reason people dream is so they can try and make their dreams come true. How can they do that if they’re all asleep for 500 years? Then we find out that this Sandman is not the only Sandman, as he makes a reference to being the Ultimate Sandman (aka the Greatest Sandman Ever), as though he’s been aiming for this title for ages and that there loads of other rival Sandmen out there. I wish we could have seen this backstory in another episode, with Sandman competitions and tournaments and such. Meanwhile, Janine ‘wakes up’ as a Ghostbuster (looking rather neat in her uniform –I used to think she was dreamy in more ways than one during this sequence, but I was very young at the time, so forgive me) and traps the Sandman, who screams an ungodly scream as he tries to exclaim his unparalleled Sandman-ness). Pity, he’s definitely one of the best antagonists in the show, shame he had to go beddy-byes. 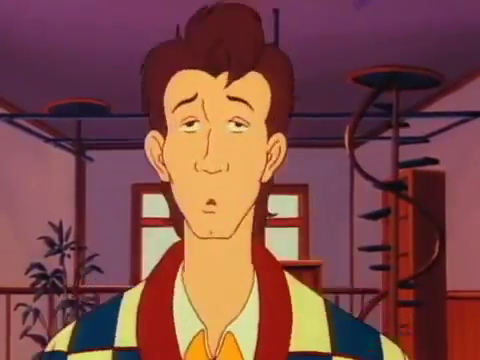 So everyone wakes up, Egon looks like a crazy person, discussing the theory of relatively to no-one in particular on the crowded streets, Peter comes down heavy following his dreams of success and Ray seems to be able to smell the pizza of his slumber after he’s woken up. After all this, the team have a celebratory breakfast, all except Winston, who’s definitely deserved a long nap – after all, he’s the only one who never got any rest. 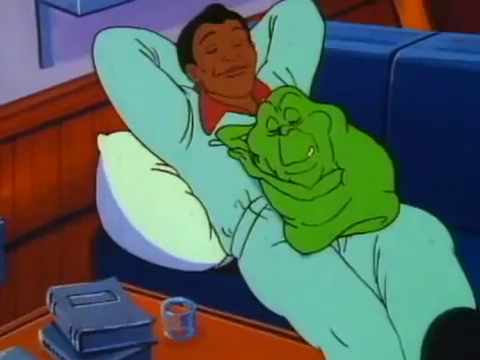 Slimer snuggles up to him and everyone goes ‘awwww’. This is a very imaginative, very funny, and the Sandman is a choice villain. Time for beddy-byes! When you wake up, don’t forget to check out my review for Episode 7, which is the Halloween one. Hey hey everyone, it’s commentary time! 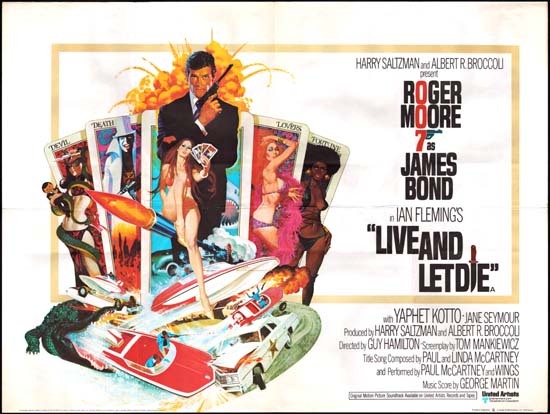 It’s time to go back to 1973 for Roger Moore’s first appearance as James Bond – this is the one with the voodoo, the Blaxploitation-riffing bad guys, the Paul McCartney/Wings theme tune….it’s a peach! Listen on the link to the right or download for free!